In BRAT, all patients were treated at a highly experienced and specialized neurovascular center; nearly 70% of eligible patients were enrolled; and the surgery was performed or supervised by Robert Spetzler, MD, the doyen of modern American neurovascular surgeons. Thus, it was perhaps a bit of a surprise that the results of BRAT and ISAT were almost identical. In our opinion, this unequivocally counters those 2 major criticisms of ISAT. It is interesting to note that no rebleeds occurred in the coiling group of BRAT. This finding probably reflects the improved equipment and techniques that are now available for coiling (similar low rates of rebleed have been documented in the recent Hydrocoil Endovascular aneurysm occLusion and Packing Study (HELPS)4 and Cerecyte trials.5 It also adds to the growing evidence that postcoiling medium-term aneurysm durability is not a clinically significant problem. The BRAT has garnered some criticism. First, it does not conform to the Consolidated Standards of Reporting Trials criteria for a scientifically conducted randomized controlled trial. Second, the protocol has never been published. Third, 97 of the 500 patients were not followed up at 1 year, and the data relating to these lost patients are not available. Finally, the randomization process was not random, which may have led to significant bias in the study. The authors note the failings of the BRAT but argue that because all of the trials analyzed produced consistent results, the methodologic differences do not negate the validity of their meta-analysis. This cannot be easily dismissed. A study should really only be included in a meta-analysis if it fulfills the criteria set down in the methods section of that meta-analysis, which, in this case, is that the study is a true randomized controlled trial. However, the authors state that true random allocation did not take place in BRAT; therefore, they have been a little disingenuous. Perhaps a better way to approach this problem might have been for the authors to simply state a caveat; that is, in the BRAT, the method of treatment allocation was not random but the method of treatment allocation, chosen for pragmatic real-life practice reasons, was unlikely to have caused significant bias to the overall outcome. The meta-analysis concludes that unequivocal evidence exists that the results of coiling are superior to those of clipping in the treatment of aneurysms. We concur and believe that this statement, which is based on unequivocal level I scientific evidence, should make it mandatory that prior to any neurosurgical clipping of a ruptured aneurysm, a formal opinion is obtained from a fully trained endovascular specialist as to the feasibility and risks of coiling. Medicolegal considerations would make recording of these discussions clearly in the medical record a given. Therefore, if coiling is the way to go for most aneurysms (where it is technically feasible), wither neurosurgical clipping? An audit of the centers that participated in ISAT postpublication demonstrated that these centers mostly coiled 80%–85% of all aneurysms within months of ISAT publication [personal communication with A. Molyneux, September 2009] (Figs 1 and 2). Improved angiographic imaging and newer devices such as flow-diverting stents and intrasaccular flow-diverting devices will likely push that figure to roughly 90% in many centers. Thus, maintaining high-quality surgical clipping services will become a problem, particularly when there are so few cases for experienced neurosurgeons, let alone the neurosurgical trainees. Along with increasing evidence on the relationship between hospital/operator volumes and clinical outcomes,8 the inevitable conclusion is that concentration of vascular neurosurgery into large-volume centers is both desirable and inevitable. The minimal catchment population to support such a setup is debatable but probably is in excess of 4 million. Any such process of surgical concentration, of course, also affects the provision of neuroendovascular services. We are all in this together. 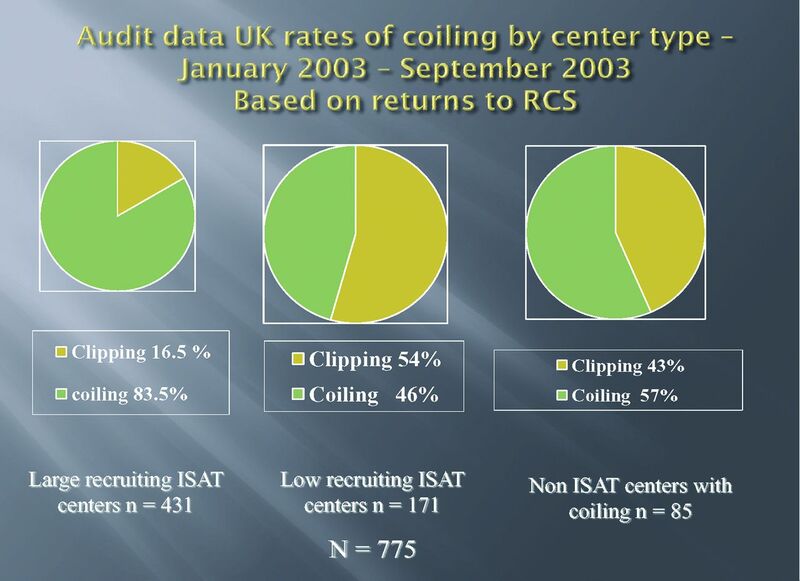 Rates of coiling and clipping in UK centers before ISAT data published. Data from the Society of British Neurological Surgeons National Audit. The Impact of the ISAT Trial data (released April 2002). Coiling rates in the large recruiting centers changed from 48% to 85% in the 6 months post data release.